Also we have a mobile trolley on sale for this unit as separate listing. The ventilator powers up OK and successfully completes its initial self-test. The display, alarms and touch screen are fully functional. Mode include - Batch C P A P, S/T, PCV & AVAPS. All modes appear to be functional but were not verified. Backup battery working at the time of testing. Overall the ventilator is in fairly good physical condition. Case have some small damage look at pictures, Screen in perfect condition. 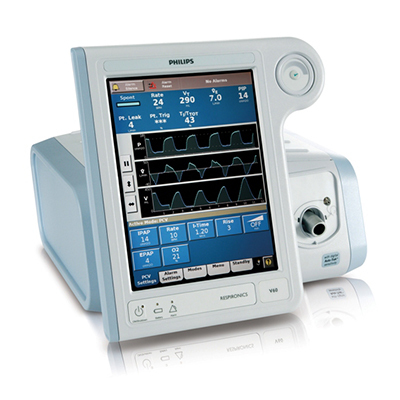 The Respironics V60 Ventilator combines Respironics’ ventilation expertise with Philips’ focus on simplifying advanced health care. The result is the noninvasive ventilation gold standard with an invasive ventilation safety net and an interactive display that helps simplify patient management. Because every breath matters and every breath is different, patients need a ventilator that always follows their breathing pattern, whatever their acuity. The Respironics V60 uses auto-adaptive technology to help ensure patient synchrony and therapy acceptance. Improved signal processing technology is finely tuned for both adult and pediatric patients.